The Verdict: Capital One’s Secured Mastercard (Capital One is a WalletHub partner) is among the very best credit cards for bouncing back from bad credit. For one thing, it doesn’t charge annual or monthly fees, which is relatively rare for a “bad credit” credit card. Its initial security deposit also figures to be less taxing on your cash flow than that required by most other secured credit cards. That’s because this Capital One gem is partially-secured, which means your credit line may exceed the amount of your refundable deposit, whereas fully-secured credit cards provide a spending limit equal to your deposit in order to eliminate risk. If approved, you will be required to place a deposit of $49, $99 or $200, based on your credit standing, and your resulting credit line could be anywhere from $200 to $1,000. In other words, you could get a $1,000 spending limit for a deposit of only $49, but you may also be required to deposit $200 for a $200 limit. It all depends on the specifics of your credit history and the current state of your finances. There is a downside to these eminently hospitable terms, however. While the Capital One® Secured Mastercard® does provide the promise of what amounts to an emergency loan, it also makes revolving a balance quite expensive, charging a 26.99% (V) APR that is well above the 18.81% industry average for secured cards. This underscores the folly in financing for cardholders whose deposits match their credit lines – why pay interest on what amounts to your own money, after all – and necessitates that others only use their unsecured spending power in true emergency situations. No Recurring Fees: If you’re starting your credit career from square one, or you’re back there after making some mistakes the first time around, finding a credit card that will approve you and go easy on your wallet is an often difficult, yet essential task. 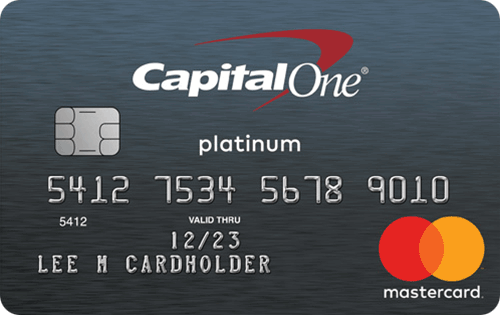 And while the Capital One® Secured Mastercard® may not have fit that bill in the past – it used to charge an annual fee – the current offer lets users build credit for free.There are no annual or monthly fees to worry about, just a late payment fee and interest charges if you carry a balance from month to month. So as long as you mind your credit manners moving forward, you’ll be able to keep more of your money in the bank compounding while your credit standing grows right along with it. Relatively Low Deposit Requirement: The fact that an investment in a better credit score could cost as little as $49 with the Capital One® Secured Mastercard® is pretty remarkable, even more so when you consider that you’ll have 80 days from account opening to cover the full deposit amount. Essentially all other options for people with bad credit come at a far higher initial cost, whether in the form of a refundable deposit or the excessive application and annual fees for which unsecured credit cards for bad credit are known. Sacrificing less liquidity reduces the strain on your finances, making it more likely that you will be able to afford other obligations and avoid shooting your credit-building efforts in the foot. Potential For Emergency Spending Power: While fully secured credit cards are perfectly positioned for credit building — offering nearly guaranteed approval and making it impossible to outspend your repayment capabilities – they don’t allow you to borrow money in times of need. This Capital One offer has the potential to be quite different, however. In addition to the low costs typical of secured credit cards, you may also benefit from emergency financing capabilities that extend beyond the amount of your refundable security deposit. This in turn could prove to be extremely helpful – enabling you to pay for car repairs that are essential to your livelihood, for example – but you must also refrain from abusing the privilege if it’s granted to you. High APR: While the Capital One® Secured Mastercard®’s 26.99% (V) interest rate is well above average, and that’s obviously not a bright spot for this otherwise excellent offer, there are a couple of key caveats that can help put this blemish into context.For starters, Capital One is offering something that most other secured card issuers are not: a credit line that doesn’t necessarily need to be prepaid. Qualified applicants who are granted spending power in excess of their security deposit and ultimately need to employ it in the face of emergency expenses will wind up accruing finance charges at a fairly high clip. That is true. But at least the option to borrow exists – 26.99% (V) is nothing compared to what payday lenders charge – and those who avail themselves of it will be paying interest on a loan rather than on their own deposit. Furthermore, whether this card proves to be partially- or fully-secured in your particular case, you should strive to make its APR a moot point at this stage in your credit career. Getting into the habit of paying your bill in full every month will save you a lot of money in both the short and long term, in addition to expediting the credit building process and providing a framework of discipline that will help you avoid the trappings that come with the higher credit lines you will be offered in the future. Not Guaranteed To Be Partially Secured: The amount of both your required deposit and resulting credit line are largely dependent on what’s in your credit report and how much disposable income you have. In other words, what does past performance and your current debt-to-income ratio indicate about your ability to repay a new financial obligation?The most qualified applicants in Capital One’s eyes may receive up to $1,000, while those with riskier profiles may not receive any, perhaps having to put down $200 for a $200 spending limit. That means you can’t count on ultimately having an emergency credit line at your disposal when you apply. But even if you are required to place the maximum deposit in return for the minimum spending limit, you’ll still be getting a credit card with no annual fee. And that’s all you really need as far as cost-effective credit building and everyday spending convenience are concerned. Credit Score Tracker: As a Capital One cardholder you’ll have access to the company’s Credit Score Tracker, which allows you to simulate how different actions (e.g., obtaining a second credit card) will impact your credit standing. It also enables you to evaluate your performance based on key metrics — such as the number of active accounts you have or derogatory marks on your credit report — that influence your score. Such a tool is an essential ally in the credit-rebuilding process, not only because it helps you keep tabs on your progress but also because you will learn a ton about how credit scores work by using it. No Foreign Transaction Fees: Like all Capital One credit cards, this Secured Mastercard does not assess a surcharge on transactions processed outside the U.S. Whether you have travel in your future or buy things online from internationally based merchants, this particular account feature will save you a lot of money. Credit Line Increases: If you consistently make on-time payments and suffer no credit score setbacks using other financial products, Capital One may proactively approve you for a credit line increase. That’s all well and good, but you certainly can’t count on it. A more practical perk, however, is the fact that you can add to your deposit over time in order to increase your credit limit by a corresponding amount (up to the $1,000 maximum).That’s important because credit limits impact far more than purchasing power, playing a crucial role in the credit building process as well. In general, the more available credit you have the better because it makes maintaining low credit utilization far easier. A higher credit limit may also make you appear more trustworthy to future lenders, as secured cards are indistinguishable from unsecured cards when listed on credit reports and anyone reading your file will thus have no idea how much of your available credit has been prepaid. It’s always good to have options, especially when your finances are on the line. With that in mind, here’s a quick look at how the Capital One® Secured Mastercard® stacks up against some top competitors, including both secured and unsecured offers for people with bad credit. PREVIOUS ARTICLEAmerican Express Serve Review – WalletHub EditorsNEXT ARTICLE How Long Does It Take To Get A Credit Card? I am still bankruptcy but I still work job. So I want to apply for credit card which to accept to fill out that I am bankruptcy?